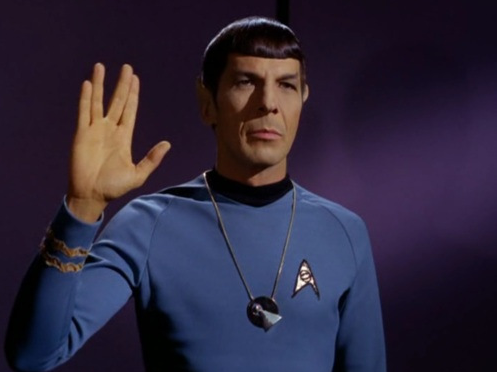 Upon the passing of Leonard Nimoy, many have wondered about the origin of the Vulcan salute/hand gesture. In the science of nonverbal communication, this is an example of an emblem - a nonverbal signal which has an excepted and highly specific meaning within a geographic region or cultural group. Although many of these involve the hands and arms, as does Nimoy's - other emblems involve the face, shoulders, legs, etc. Mr. Nimoy was Jewish and "created the sign himself from a childhood memory from the way Kohanim (Jewish priests) hold their hands when giving blessings". The understood corresponding and proper accompanying verbal statement with this Vulcan gesture is "Live long and prosper" with the lesser known response being "Peace and long life" (although sometimes this order is reversed). Rarely if ever in human history has a nonverbal emblem so rapidly taken on a near universal (almost World-wide) recognition as the Vulcan salute/hand gesture. This nonverbal, although part the culture of a fictional people from another planet - has, along with Star Trek, over the past couple of generations become a cultural phenomenon. Of course only in the relatively recent past has television, film, the Internet and other media existed - thus facilitating this process of moving from a fictional world to our real one. Mr. Nimoy was in the right place at the right time - yet it still, in Spock's word, "Fascinating!" Below, Astronaut Terry Virts' hand is configured in the Vulcan symbol. 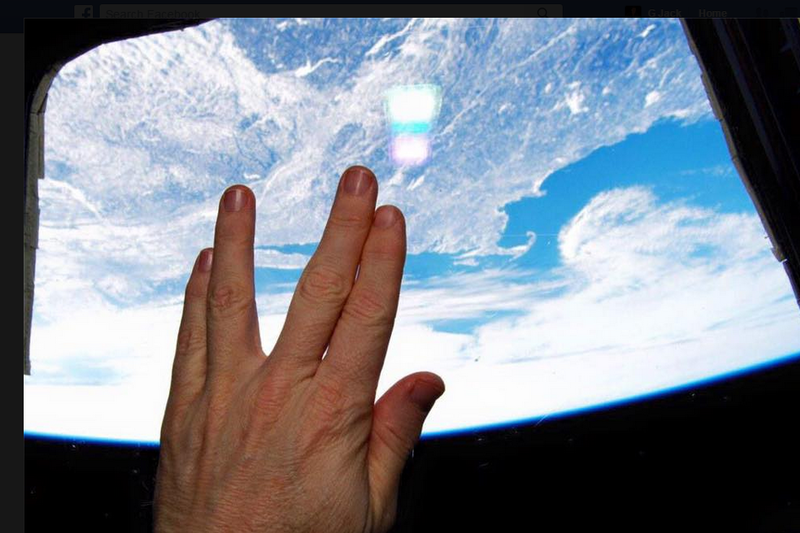 It photographed from the International Space Station and tweeted on the Day after Leonard Nimoy's passing. In the background is the Earth - where Cape Cod and Boston (where Nimoy was born) can be seen. Nonverbal Communication Analysis No. 2641: John McCain with Protesters in Kiev, Ukraine - You Feel Safe There?